Very Indulging Food Promos ~ Philippine Freebies, Promos, Contests and MORE! Enjoy your passion and express it in any of the two very indulging food promos online. 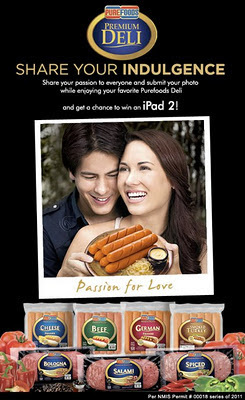 Share your indulgence by submitting your own photo enjoying any of your favorite Purefoods Deli products. Tag five (5) of your friends who you want to share your image with for a chance of winning an Apple iPad 2 or iPod Nano 8GB. On a similar note, capture of shot of yourself enjoying the new KFC Streetwise Spoonfuls and get lucky to be drawn and bag round trip tickets for two (2) to Hong Kong with 4-day/3-night hotel accommodation plus P10,000 pocket money to splurge in various shopping districts of Hong Kong. 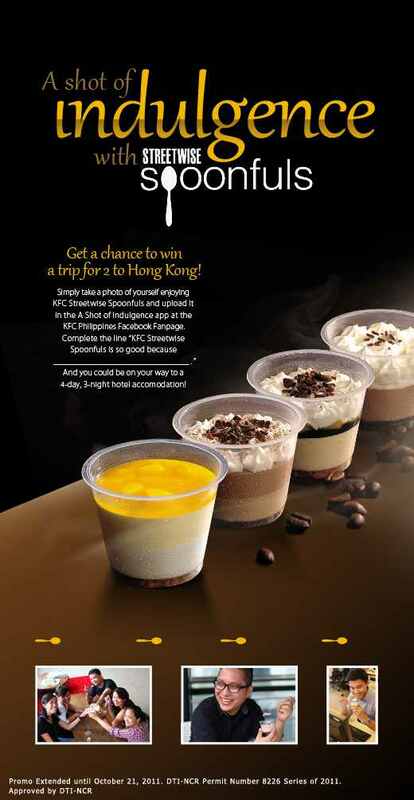 Must complete the entry line, "KFC Streetwise Spoonfuls is so good because ______."